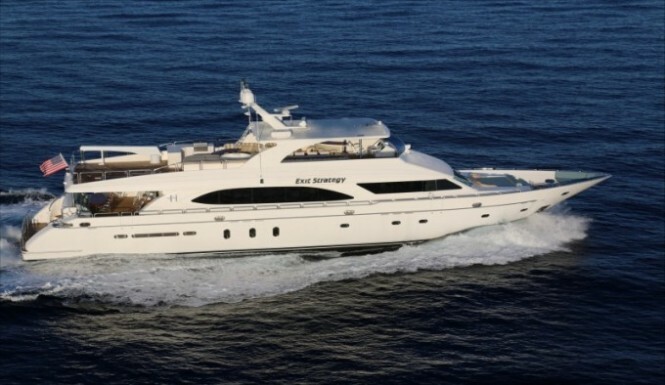 Stunning Motor Yacht Exit Strategy offers a HUGE discount on New Year’s in Miami. Available dates are 28 December – 2 January at a very special rate of $32,666 plus expenses. This deal is amazing, as price is as low as it could possibly be. Plan a luxury yacht charter vacation now, while she is still available. You will fall in love with this luxury yacht, as Exit Strategy is a very special lady. The experienced crew of 5 is prepared to meet your requirements with attentive professionalism, ensuring your charter experiences is truly amazing, full of fun and relaxation. For those who love the life on the water, Exit Strategy has a large number of toys and a tender for the guests to enjoy. Exit Strategy was launched in 2006 by the American yacht builder Hargrave. 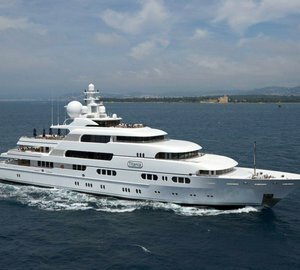 At 32 metres (105ft) she features a 6,71m (22′) beam, and provides accommodation for up to 8 guests in total comfort. 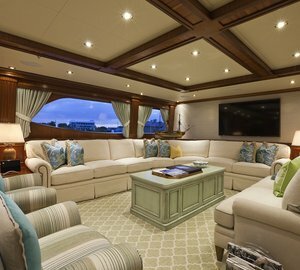 Interior design of the yacht is fabulous. African mahogany, smooth South American marble and soft leather add to the opulent style. Four guests cabins feature warm colours of the mahogany and light fabrics creating a welcoming atmosphere. Guests accomodation includes the master stateroom, VIP stateroom and two twin staterooms. The master stateroom has a seating area, a 46″ TV, a spacious walk-in closet for his and her wardrobe, and a large bathroom. This is a perfect environment to relax and unwind after the day’s activities. The VIP stateroom had a minimalistic design alike the other guests room. However, the clean look add to the sense of serenity and total relaxation. Your most privileged guests will enjoy this roomy cabin, which features an oversize hanging closet, 40″ TV and an en suite. The twin cabins each include twin beds, which can be converted into Queen beds. Interior is also stylish, with 32″ TVs, en suites, hanging closets and large mirrors. The entertainment and dining area are located on the main deck. The luxurious salon features a large L-shape leather couch which seats 8 people, a wet bar with an onyx top, a pop up flat screen TV with full entertainment system. Clear glass table at the front of the lounge area provides seating for 8 people in a fine dining atmosphere. The large open style galley features a small seating area with table and helm station. Exterior living spaces are very roomy, which is ideal for the warmer climate of Miami. The aft deck provides an al-fresco dining option, a seating area and a TV. The full beam swim platform is located at the aft. Sunbathing area is situated on the main deck, with another seating space and sunpads. 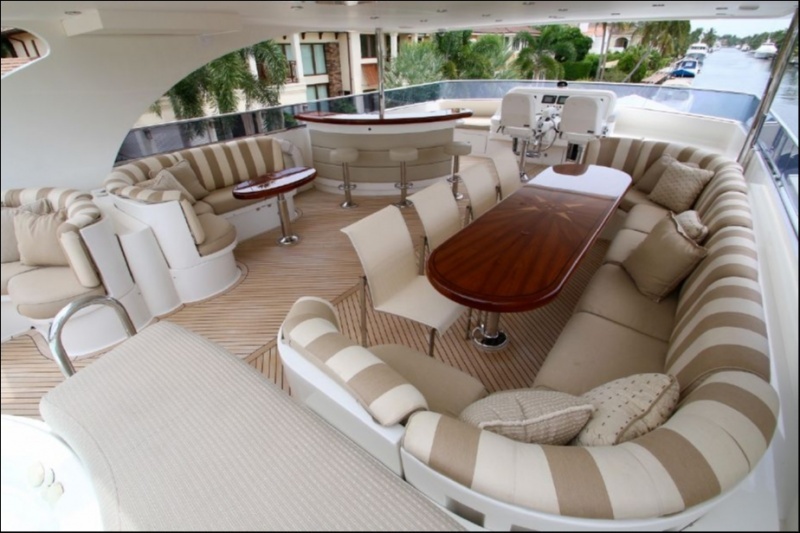 The flybridge deck is also perfect for entertainment. There you will find plenty of sunpads and seating with partial shade, a wet bar, a large BBQ and service area, another alfresco dining space and Spa pool with a bar top. Powered by 2 Caterpillar C30 engines, Motor Yacht Exit Strategy can reach a maximum speed of 20 knots, and cruise comfortable at 17 knots. 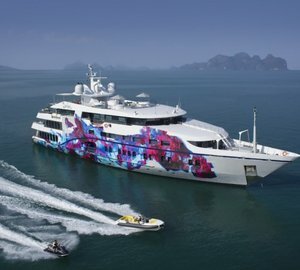 If you want to make this New Year’s celebration very special book this luxury yacht for charter right now. Contact your preferred broker at CharterWorld now. This special offer includes 5 days for the price of 4 days – only $32,666 plus expenses. Please contact CharterWorld - the luxury yacht charter specialist - for more on superyacht news item "HUGE DISCOUNT on New Year's in Miami - Motor Yacht Exit Strategy". 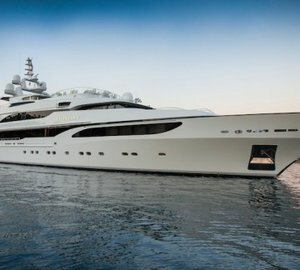 The majestic superyacht SALUZI offers an incredible discount of 20% off all charters booked this winter!